Black frock coat There are 5 products. 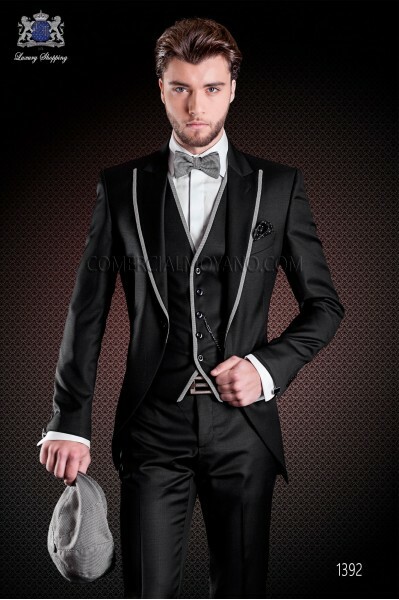 Italian short-tailed wedding suit with Slim stylish cut. Exclusive short-tailed suit made from black acetate and wool woven with peak lapel with single patterned button closure and contrast fabric piping. Flap pockets with contrast trim and angled buttonholes. It comes with bag garment bag Ottavio Nuccio Gala. Italian bespoke black frock coat wool mix suit with peak lapels, satin contrast and 1 button. 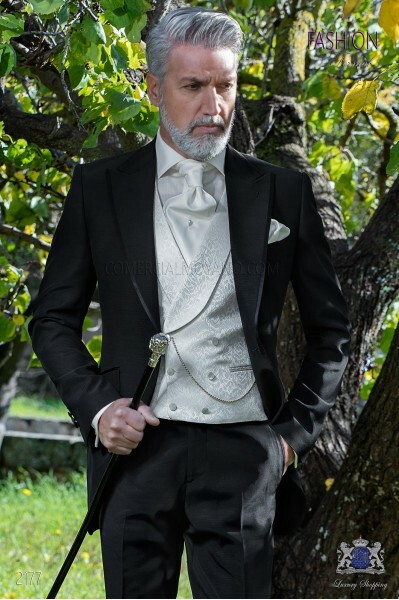 Wedding suit 2177 Fashion Formal Collection Ottavio Nuccio Gala. Italian short-tailed wedding suit with Slim stylish cut. Exclusive short-tailed suit made from black wool sateen woven with peak lapel with contrast fabric piping and single mother-of-pearl button closure. Flap pockets and angled buttonholes. It comes with bag garment bag Ottavio Nuccio Gala.